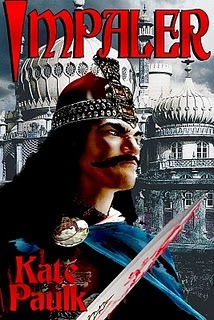 Impaler by Kate Paulk revisits the tale of Vlad Dracul, also known as Vlad Tepes and Vlad the Impaler. This is the tale of historical fact mixed with fiction and a touch of fantasy. But this is most definitely not the tired tale of vampires skulking in the night, lying in wait for innocent victims. Impaler tells the tale of a man devoted to family and country, cursed and looking for redemption. His army is outnumbered and outclassed, his country is tiny, and he is haunted by a terrible curse. But Vlad Draculea will risk everything on one almost impossible chance to free his people from the hated Ottoman Empire. You can purchase Impaler now from our site . It will be available from Amazon, Barnes & Noble and other e-book retailers in the coming days. You can check out her schedule here. Kate Paulk is today’s guest blogger. Born in Blood, the prequel to Impaler, was published last November. Impaler will be published by NRP in March. In this post, I’m going to cover some of the reasons Vlad Dracula intrigues me. Most of the information here comes from my conclusions drawn from a relatively sparse historical record. Where I could, I read translations of primary sources (all hail Google). The rest is from the standard Dracula references, interpreted with an eye to why Dracula acted as he did. First up, it helps to remember this was a brutal era by anyone’s standard. Even Vlad’s favored method of execution – impalement – was pretty normal in the Ottoman Empire. For instance, Ottoman policy was that any ships trying to evade the Ottoman tax assessors (who were based at the forts known colloquially as the “throat-cutters”) be sunk, and the survivors impaled. I gather it was an effective way of discouraging tax evasion. Another point of perspective is that every one of Vlad’s European contemporaries was at some point in their youth held captive or hostage, with a real chance that they’d be killed by their captors. That kind of thing doesn’t make for nice, well-balanced individuals. Then there’s the situation in Wallachia. We’d call it a failed state. The noble class (boyars) were choosing princes and then betraying them at a phenomenal rate (at one point the average reign was less than six months), there was no effective law, and the old free commoner class was being forced into serfdom by the boyars. Vlad was smart enough to see that he’d lose everything unless he could restore order – but to do that he’d need to take drastic measures. Those measures became the “meat” of the Dracula horror stories. the “oddball” cases, which seem to me to be Vlad’s vile temper: the documentation available suggests that he was prone to fits of rage that weren’t that far off berserker fury. These were probably the atrocities that did the most damage to his reputation. Interestingly, there’s also evidence that Vlad was well aware of his faults. He was well known for seeking isolation to pray, often for hours, and made many generous bequests to the churches of his area. This entire mess would have been problematic in the best of circumstances, and Wallachia wasn’t anything like the best situation around. It was a buffer state between the Hungarian Empire and the Ottoman Empire, with effective control wavering between the two depending on who was paying more or had better hooks into the Wallachian Prince. Betrayal happened on every level imaginable. Then you’ve got Vlad’s personal history: he was twelve or thirteen when he and his eight-year-old brother Radu were handed to the Ottoman Sultan Murad II as hostages – in circumstances where Vlad’s father Vlad Dracul wouldn’t have left alive if he didn’t hand his sons over. The details of the next five or so years aren’t clear, but some of the things that are known aren’t exactly comforting. Once he was free of Ottoman lands, Vlad’s father Dracul played a hugely risky double-game, taking no direct action against the Ottomans, but discharging his obligations as a Hungarian vassal by sending his oldest son Mircea with troops to support John Hunyadi’s campaigns – a tactic that placed his younger sons in serious danger of torture and mutilation at best. There are letters that have survived where Dracul is practically begging Hunyadi to release him from his obligations so he can fetch his younger sons back to safety. Evidence of the conditions of Vlad and Radu’s imprisonment varies: some sources suggest that they were kept in the kind of conditions I described at the start of Born in Blood, where others suggest the two princes had relative freedom and were educated in part by the same tutors teaching Murad’s heir Mehmed (later Mehmed II Conquerer). In addition, Mehmed was well known to be a thoroughly unpleasant specimen, vindictive, cruel, and with a taste for attractive boys (as Sultan, he was well known to keep a boy harem). There’s evidence that he raped the hostages – and aspects of Vlad’s actions support the possibility of his having been sexually abused in Ottoman custody. That he was physically abused is without doubt – there’s casual mention in the Ottoman records that he was sullen, bad-tempered, and regularly beaten for “insubordination”. His brother, on the other hand, was a favorite of the tutors and ultimately became well known as Mehmed’s catamite. I chose the sequence of events in Born in Blood as the most likely, given the information available. Vlad’s less-than-perfect memory of that part of his life shows up as short flashbacks in Impaler at times when he’s stressed and something reminds him of what has to have been the worst part of his life. From Vlad’s perspective, everyone he should have been able to trust is either taken from him in some way, or betrays him. His response appears to have been to withdraw into himself, and later, to constantly, almost obsessively test the loyalty of those he doubted – which was almost everyone. his father was betrayed and murdered by his liege lord and his supposedly loyal boyars. Vlad’s own liege lord (Wallachia was a vassal state of Hungary) King Matthias Corvinus, not only failed to send promised military aid, he used the gold he’d been sent for an anti-Ottoman crusade to ransom the Hungarian crown (the story behind this is long, convoluted, and not proven – but the evidence points very strongly in that direction), then forged documents purporting to prove Vlad was conspiring with the Ottomans to justify arresting him and holding him as a political prisoner. Later, Matthias forced Vlad to convert to Catholicism (he was Orthodox), a conversion reinforced by marrying Vlad to his cousin Ilona Szilagyi, most likely as a condition of releasing Vlad from captivity. Vlad remained effectively a dependent of Matthias for a number of years after this, before he was given the forces he needed to recapture Wallachia. A few of the other knowns were that Vlad hated Mehmed II with an unholy passion – and was the only man ever to terrify the sultan into retreating from a war. The various accounts of Mehmed’s reaction to the Forest of the Impaled all end with him and his hardened soldiers retreating – some versions have them fleeing, leaving… deposits… as they ran. What I think is likely is that Mehmed realized the ranks of impaled men (most of them dead – Vlad’s armies had been gathering every corpse from every battle for weeks) were a pointed message for him personally: this was his fate if Vlad ever got hold of him. It’s the only time Mehmed II retreated, and he never set foot in Wallachia again. All subsequent Ottoman action in that part of the world was done through proxies. I think it’s reasonable to draw the conclusion that Vlad terrified Mehmed – and that Mehmed knew if Vlad ever regained power, he would be fortunate to die in battle. In those circumstances, Vlad was quite possibly the only kind of person who could survive and turn things to his advantage. He needed to be brutal simply to survive, but he needed to be intelligent and quick-witted to actually win more than a temporary throne. It’s the tension between the two needs and Vlad’s desire to spare his children the life he endured that drives much of Impaler. In tomorrow’s post at my site I’ll explore the Vlad of Impaler, the man behind the monster stories.